I was walking through my garden last night and saw something blooming that I knew would make a great "In a Vase on Monday" candidate. This something was something I don't grow much of, in fact, there are only two stalks of blooms of this something in my garden at present and that may likely be all I get for this year. This something is also something that I think really does look better in a vase than in a garden and I can't think of much of any other somethings that I can say something like that about. I got rid of that and then remembered the something that I was going to prune for my vase and knew if I waited much longer, the somethings weren't going to be anything because each bloom doesn't last very long anyway. I cut them and then I cut something else to go with them and went in the house and arranged my bouquet. I'm not a very good bouquet arranger, but flowers are pretty no matter what you do with them, so it looked okay to me. That's what mattered. I photographed the bouquet from this angle and that and got ready to do my blog post for the meme, "In a Vase on Monday, " hosted by Cathy at Rambling in the Garden. But the photos of the arrangement I did today will have to wait until next Monday. Because there's an even better arrangement already in my house. You may recognize these as Queen Anne's Lace (Daucus carota). They can be seen with such frequency around here right now that they seem downright invasive. In fact, they are not only on Ohio's Invasive Species list, they're on the Well-Established Invasive Species list. If you've ever received a floral bouquet picked by a child, you know what I mean. Last fall, after giving our hens another year to start laying more, when they didn't, we decided to give them up to a local family, who's raising them on their farm. We're told that one of the Buff Orpingtons has turned out to be a good little mother hen, sitting on eggs that later hatched. That makes me happy. On Easter Sunday this year, we got new chicks, eight of them again. Two Black Australorps, two Americaunas, one Buff Orpington, one Leghorn, one Rhode Island Red, and one ISA Brown. I just wanted a variety. 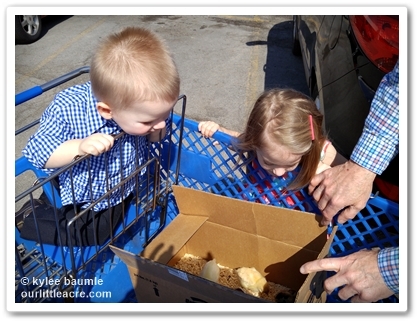 We took two of the grandkids with us to Rural King, which is where we got our last ones. We had great success with them, with virtually no problems, and we're hoping that will be the case with these too. I thought the chicks looked older when we got them and I questioned the sales associate. She assured me they were just a few days old, that they'd just gotten them in. The first clue was that several of them were quick to use their wings to jump up on the side of the container we started them out in. Within the week, they were hopping up there. Time to put them in the coop. Owl, the white Leghorn on the lower left, was larger right from the start. 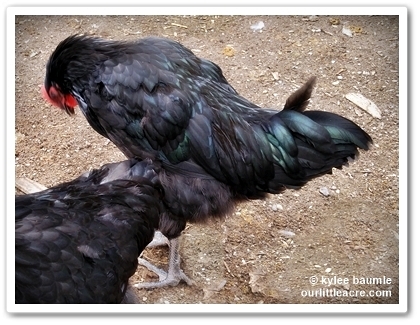 And then one of the Black Australorps started crowing. Crow. Ing. When my husband first told me, I just went into denial. I researched to see if hens ever crowed. Oh yes they do! Yay for crowing hens! With no signs of spurs growing on their legs, I remained hopeful. The Australorp kept crowing. or not one of them (or possibly both) was a rooster. 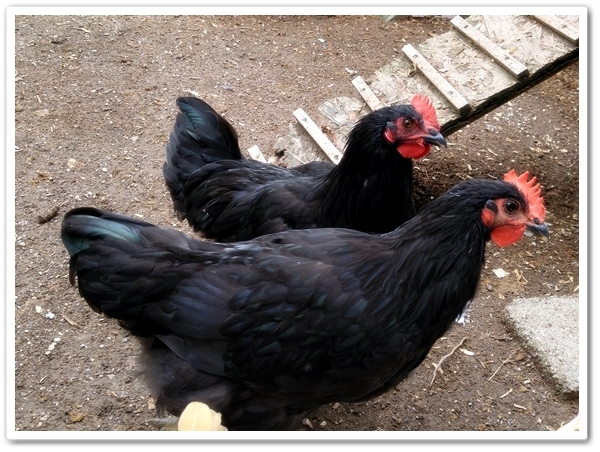 The Australorp grew beautiful iridescent tail feathers. My hope was fading. And then I heard a crow IN STEREO. 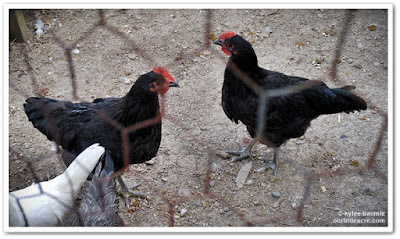 So now what do we do with two roosters, who most assuredly will not lay eggs? We could eat them, but there's no way I'm going to butcher them. And no one wants roosters. Do they? I wouldn't mind having one, just for the novelty of it, because I actually do love hearing them crow. But not two. We didn't get them for pets, we got them for eggs. Feeding two roosters who will not hold up our end of the bargain just doesn't work. Doesn't SOMEONE want a rooster? Or two? They're really quite handsome. Owl, the Leghorn, was the first to lay an egg! How do we know it was her? She's the only white-egg layer we have. When the 4th of July happens around here, it seems like summer is half over. Of course, this isn’t true, except for the school kids and that was a long, long time ago for us. There’s a lot of summer left in the garden too, and one thing that we’re sure to be doing in the hottest and driest part of summer for us here in NW Ohio, is some watering. 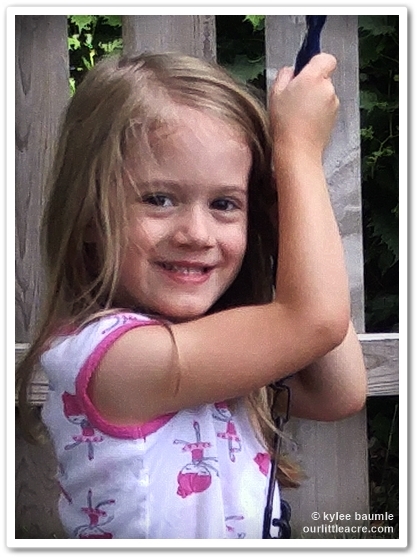 Recently, the Fiskars people contacted me about trying some of their products. I’ve always been a fan of Fiskars and somehow missed the fact that they acquired Gilmour, maker of garden watering products, back in 2014. Of all the things I received to try, the Super Duty Thumb Control Watering Nozzle was my favorite. In their description, they talk about a nozzle having “the right heft” to it, and I have to wholeheartedly agree. This just feels right in your hand. And it’s really easy to control with that thumb lever. The nozzle head itself has eight spray patterns: Flower, Sweep, Garden, Shrub, Clean, Soft Wash, Rinse, and Jet. It has stainless steel connectors so it doesn’t corrode and get hard to disconnect from your hose. They also sent me some Quick Connect components though, so I don’t even have to unscrew the nozzle to remove it. I just pop it off. The Quick Connect set makes it easy to take the nozzle off and on from the hose. Oh, and it comes with a lifetime warranty, too. I. Love. This. Nozzle. They also sent me a Flexogen® Super Duty Hose. If there’s one thing that I hear gardeners complain about, it’s hoses. First of all, they don’t like heavy ones and secondly, they hate how they kink. I’ve complained about these very things myself. The Flexogen® IS lightweight AND it honest-to-goodness DOES NOT KINK. I can't believe it, but it's true. Now this is saying something, because we have really low water pressure. I've had hoses that are supposed to resist kinking under pressure, but when you've got low water pressure, it's hard to make a product that simply won't kink. But Gilmour has done it. The other thing is, this Flexogen® hose really is pretty lightweight. As someone who suffers from degenerative disc disease in my neck (as so many my age do), I appreciate how much lighter in weight this hose is than some. There's nothing I hate worse about water hoses than dragging one around that behaves like it was a 50-lb. boa constrictor. Flexogen® hoses have eight layers and have been tested and proven to be the strongest and longest-lasting hose in its class. It's made with heavy-duty brass couplings to hold up well under use. Also, the polished exterior resists dirt collection, unlike some other hoses I’ve tried. Of course, it’s gray, so it wouldn’t show much dirt anyway, but still. It's my new favorite hose! This giveaway will end with a random drawing on Saturday evening, July 9th, at midnight EDT. All you need to do to enter is to fill out the Rafflecopter form. That’s it. But if you want bonus entries, check out the extra options when you fill out the Rafflecopter form. There are lots of ways to get a bonus entry! *I received these products from Fiskars/Gilmour for the purposes of reviewing them and hosting a giveaway. As always, I won't say anything about a product that isn't the truth from my own personal experience with it. I have received no other form of compensation for writing about these products.